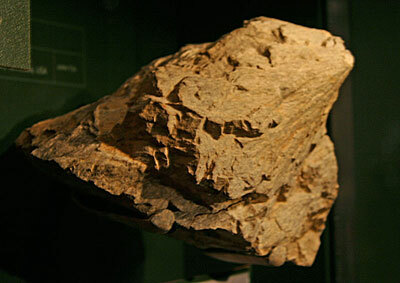 Shatter cone, American Museum of Natural History, August 2006. A shatter cone is formed by shock due to the impact of a large meteorite or asteroid (the cone points in the direction of the impact). This specimen is from the Wells Creek Crater in Tennessee.